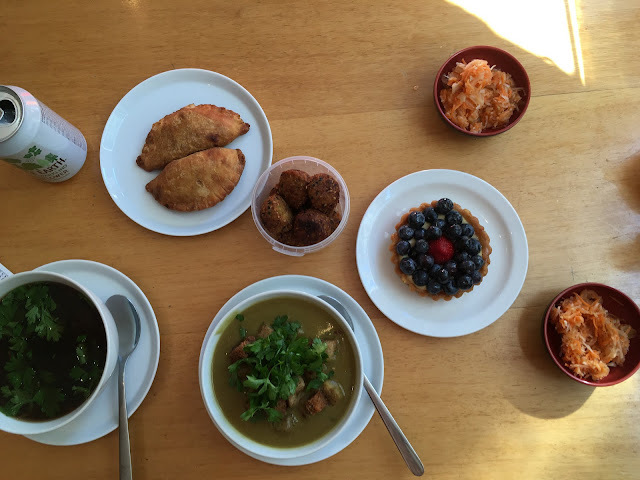 Deshima is a vegan, macrobiotic restaurant in Amsterdam that blew me away! They are a lunch place only, but close around 5pm, so we snuck in for the last items they had available. Even so, they had really healthy, amazing food. We had the seitan roles which looked like little empanadas and were extremely good. It was paired with two soups of the day, a miso/mushroom/Japanese soup and a pea soup. There were also these little crunchy bites made of (tempeh?) and a SUPER good blueberry and cream tart. Now, if that whole meal sounds weird and thrown together, it was, but it all tasted amazing. The meal was super healthy, made me feel full but without a greasy/tired feeling. The prices were extremely good and the place was cute and pretty close to the center of town. I would definitely come back here again and again if I could!